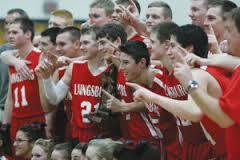 Laingsburg boys basketball team became the pride and inspiration of our small community. The team's unmatched spirit, drive, class, determination, and sportsmanship touched and inspired everyone within the community, and many more far beyond Laingsburg. Nick Brown, assistant coach Jason Walker, coach Greg Mitchell, and the Red Thunder student section for your class, your honor, and your character. GO WOLFPACK!